Here is ModLoop tool, which enables a Renoise user to modify the selected sample loop properties dynamically. This is my first tool, so I’m open to any sort of feedback! This is also still very much a work in progress. Please report any bugs you find. I’ve concluded that I won’t be able to do many of the things I was hoping with this tool, but will likely delve deeper into creating a plugin for this purpose in the future. Looking good, can we dl it somewhere to test-drive? ‘C:\Users\pluge\AppData\Roaming\Renoise\V3.1.1\Scripts\Tools\ca.tonyscc.ModLoop.xrnx’ failed to execute in one of its menu entry functions. will play around some more. I won’t be back in front of my Renoise system for a few hours. the main loop only does something if the song is playing. I should have mentioned that. Wish it would be possible to be able to use renoise’s native render to sample in combination with this, of course the render to sample shortcut works and a sample is created, but without the creative mangling your tool creates when a pattern is running, just a static loop. Thanks! Thought it wasn’t working, this is great! Great!! I’ve updated the tool so “start” and “stop” always make sense and it won’t launch if there are no selected samples now. I’ll keep at it. Yes, having the option to only modify one of the loop points if the user wants some manual control also is a potential mode to throw in as well. …now it’s much more sensible though, if you disable control of a loop point and move it somewhere and resume control, it resumes from where you moved the loop point. I’ll be more cautious about future releases. I’m very happy that this tool is coming together, I’ve wanted to automate this process for … years. I think my only other previous posts on this forum prior to 2017 were related to changing the sample loop positions with track effects in the sequence. Yes I’ve also been thinking about a feature like this for a Long long time already. Finally it’s there! So many thanks for that! I’ve tested it a bit more, and for so far it works nice! Before I declare version 1.0 I’m going to have to fix all the problems of the parameters potentially being outside the sample properties. Right now there are no checks to see if a sample is smaller than the intended velocity or pitch for example. I put my idea out before working out all the potential issues. There are some constants related to this, however they are in the tool’s preferences.xml file. If you prefer much higher velocities you can set “maxvelocity” higher (look out for exceeding the sample playback speed though), or if you want more control over lower velocities you could set maxvelocity lower I guess. If you don’t like high pitched sounds in loose mode during collisions you can set “minframes” higher (hopefully that value turns out to be smaller than your sample size). I believe renoise has to be closed in order for changes to the tool’s preferences.xml file to work. I’ll likely include control of these values soon. It might be handy to use the selected pitch for minframes. And about that selected pitch… the note displayed really only makes sense if you’re playing the base note of the sample at the time. 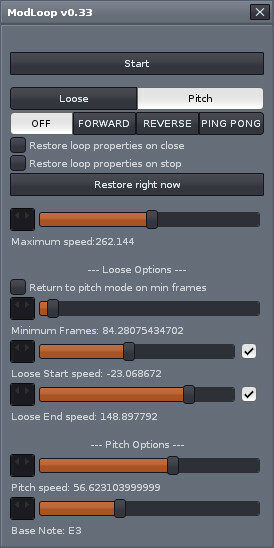 There is no determination made of the actual pitch involved due to playback speed… yet. A few more changes today. Version 0.20 released with better control and the ability to gracefully return to pitch mode from loose mode. Comments, questions, bug reports welcome. ‘C:\Users\pluge\AppData\Roaming\Renoise\V3.1.1\Scripts\Tools\ca.tonyscc.ModLoop.xrnx\main.lua’ failed in one of its notifiers. Thanks for testing Djeroek, I’ll try to handle new songs opening up in the next release. Quick snippet if it helps for closing dialog on new song. right now I’m slapping a recorder vst on the particular track I’m modlooping, tweaking the sliders while recording to create .wav files of crazy timestretching/granular-like effects. As stated above, I’d love to be able to use Renoises native render selection to sample in the pattern editor, but as far as I can see, Renoise resets the tool start to stop whenever you try to do this. Could there be a way to circumvent the reset? I see the the gui sliders and buttons can be midi mapped, but not sure how the midi mappings can be recorded inside the pattern editor so I can for example aim the tool to start at line 0. Currently playing around with an instr midi control meta device without any luck yet.